"When did everything start having an expiration date? Swordfish expires. Meat sauce expires. Even plastic wrap expires. I'm starting to wonder: is there anything in this world that doesn't?" The French New Wave comes to Hong Kong with Chungking Express, writer-director Wong Kar-wai's breakthrough film, and the most loveable movie on his challenging, idiosyncratic resum�. This is a director for whom cinematic style trumps substance, and this is a movie that is engaging and alive with feeling and emotion, even if it doesn't quite hang together as a story. Or rather, stories. Chungking tells two of them (and was slated to be an omnibus, but third segment was shuffled off and became its own thing�the pseudo-sequel Fallen Angels). Both segments are about the search to make connections in a large, impersonal city; the desire for something real in a manufactured world. The two stories mirror each other but never really connect; the resulting narratives feel improvised and incomplete, but offer depth beyond their glossy surface. Both our protagonists are police officers. The first 40 minutes or so is about Cop 223 (Takeshi Kaneshiro), a lovelorn young man who has just been dumped by his girlfriend May. Their relationship ended April 1, and he decides he'll give her a month to come back to him, and counts down the days by eating cans of pineapple set to expire on May 1 (a romantic notion, though I don't think May knows or cares about the ultimatum). He crosses paths with a femme fatal drug dealer in a platinum blonde wig (Brigitte Lin, in her final role), but the way their story plays out is anything but typical cops and criminals stuff, despite some gunplay that seems intended to either tease or placate the international audience's expectations of action-packed Hong Kong films in the style of Jon Woo. The film's longer, more engaging second half is about Cop 663 (Kar-wai favorite Tony Leung, one of the most famous actors in Asia), for whom a relationship is also ending�his flight attendant girlfriend has taken to the skies without him. His puppy-dog stare entrances Faye (pop singer Faye Wong, making her film debut), the counter girl at the Midnight Express diner, and when chance puts a key to his apartment in her hands, she makes it her personal mission to improve his life, entering his home to rearrange his furniture (and the labels on his canned goods). Heartbroken, Cop 663 is sleepwalking through life, and it takes him a while to notice what has changed, and by the time he does, he might have already missed his connection. On the surface, Chungking is a schizophrenic film, with the underdeveloped gangster plotting of the first half petering out, only to be replaced by a cutesy, Amelie-style romance in the second hour. But what unites the two halves, and why the movie transcends, is Wong Kar-wai's irresistible style. The movie has the loose, improvised feel of the French New Wave, with an undercurrent of decidedly modern urban malaise. His characters are wandering through a lonely, crowded landscape, and the irony of being disconnected from humanity even in one of the world's largest, most vibrant cities is the paradox that gives Chungking emotional weight above and beyond its simple plot. It's a movie that is engaging on a purely aesthetic level. Cinematographers Christopher Doyle, a frequent Kar-wai collaborator, and Andrew Lau (now best known as the director of the Infernal Affairs trilogy, remade in the U.S. as The Departed) deserve credit for crafting visuals that paint a picture as lonely as the lead characters; scenes flicker with the harsh glare of fluorescent lights, and some have a rotten green tinge that hints at the unnatural sickness of the city. The cast is populated with some of the most beautiful and bankable Asian stars. And the music�the wonderful strings score aside, now and forever, this movie owns California Dreamin' and the Cranberries' Dreams (granted, the latter is a cover version sung by Faye Wong, but the difference is negligible, despite the fact that one of them is in Cantonese). I love it when a movie makes perfect use of a pop song, and if many scenes in Chungking Express play out like music videos, I suppose I can't complain too much. In mood and tone, Chungking Express is a world away from the moody, languorous dramas that have become Kar-wai's signature as of late (In the Mood for Love, 2046, My Blueberry Nights), movies that have earned him the unofficial title as the world's most romantic filmmaker. But really, this one is of a piece, a romance about characters looking for love and a director in love with cinema. Image Transfer Review: Miramax but out a decent barebones edition of Chungking several years ago; this transfer is different in a number of ways, and carries a stamp of approval from cinematographer Christopher Doyle. The aspect ratio is 1.66:1 (the previous transfer was 1.85:1), and conveys Doyle's stylistic flourishes well—heavy, intentional grain, washed out colors, and a greenish tinge that is the DP's hallmark. Focus is a bit soft here and there (likely due to the filters used in many shots), giving the picture an appropriately dreamy quality. If you can hold out a few weeks, a Blu-ray edition of the same transfer is coming in December. Audio Transfer Review: The new 5.1 surround track is a real upgrade from the previous release, which offered only stereo. The audio is still fairly subdued, but the presentation of the songs in the second half (the familiar refrains of California Dreaming) sound a lot better with support from the surrounds. Dialogue comes through well from the center and there is a bit of directionality across the front channels. Extras Review: Chungking Express is the second Wong Kar-wai title to get the Criterion treatment, and it's hard not to be a little disappointed in the extras after the outstanding job they did with In the Mood for Love more than six years ago. This especially considering the identical price points (holding true to the missive that Criterions with a commentary are always more expensive even if they otherwise lack significant features). That said, there are a host of reasons the disc costs what it does (the film had to be licensed from Miramax, for one thing), and at least said commentary is a good one. We've heard from "noted Asian cinema critic Tony Rayns" (I'm pretty sure they mean Asian films... he sounds pretty British to me) on a few other Criterion discs, and he can always be relied on for interesting insights. He doesn't spend much time analyzing the movie itself (often noting after the fact things he'd meant to point out), but rather concentrates on the director's career, the guerilla production of Chungking, and the relationship between Wong Kar-wai and cinematographer Christopher Doyle (the two worked together on eight films before they had a falling out over the turbulent production of 2046). It's not exactly juicy stuff, but full of intimate details nonetheless (Rayns is a friend of both Doyle and Kar-wai). Of note: the apartment that Faye redecorates throughout the latter story actually belonged to Doyle, who wasn't to happy with the flooding scene. Sadly, there's not much else here. A 12-minute clip from the British series Moving Pictures, filmed amid the release of the pseudo-sequel Fallen Angels, provides some input from Doyle and Kar-wai, who gives a tour of some of Chungking's Hong Kong locations, but it's over just as things get interesting. Miramax's U.S. trailer doesn't sell the film well at all, overemphasizing the gangster elements. The insert includes a wordy essay by film critic Amy Taubin, who places the picture in the historical context of Hong Kong, three years prior to its reversion to Chinese sovereignty. 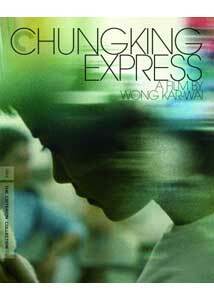 Revered director Wong Kar-wai's most accessible, purely enjoyable film, Chungking Express is romantic, thoughtful, sweet, and sad; a dreamlike vision of the happiness and heartache of the search for connection in a crowded, impersonal city. Criterion's second release from the director doesn't overwhelm you with supplements, but the movie says it all.